#Reigate weather this week: our turn for some “winter” action? So far this winter Reigate and the SE has been sheltered from much of the weather action, which has focused mainly on the NW and especially Scotland. This coming week might change that somewhat, albeit modestly in comparison with the battering the NW has received. 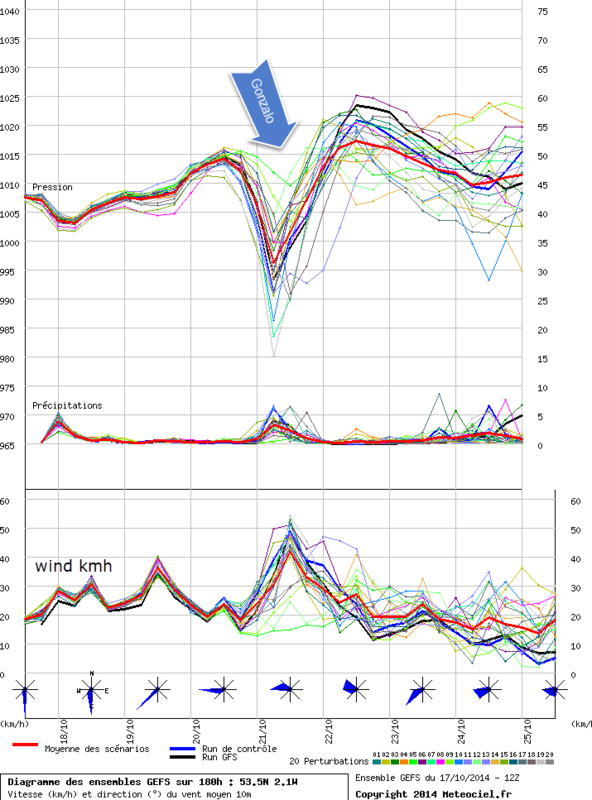 Charts below show temperatures and pressure are overall on the slide this week while precipitation makes two noticeable spikes. A moist warm airflow ahead of a slow moving cold front arriving from the north Monday pm could stall over the SE overnight into Tuesday am and bring significant rainfall totals. Temperatures Monday night could hold up into double figures as a warm moist SW flow funnels up from the subtropics ahead of the sluggish cold front. The wave on the polar front emerges out of the SW through Monday with a characteristic plume of rain and a dip in pressure. Such waves tend to bring a lot of rain despite hardly showing up on synoptic charts. A modest kink in the front and isobars (see charts below) is the only hint of potential heavy rain action. Some wintry precipitation and maybe snow is possible for places on the north side of the front later into Tuesday, in Wales/Midlands for example, but not for the SE as temperatures remain too high. The front slips slowly south Mon/Tues bringing some significant rain and then brisk cooler weather from showery westerly winds to follow, some sparse showers could possibly be wintry Tues-Weds but not amounting to much for us, most wintry showers will fall further west. Temperatures will be cooler at Tmax 5-6 on Tuesday and even cooler on Weds, so cold but frost unlikely as too breezy. There is a weather warning out for this period especially for the south coast but Reigate totals could reach 20mm+ and exceed 20-30mm for places nearer the south coast in Sussex. The front is followed by increasingly cool showery westerly winds through Tuesday into Wednesday with the odd wintry shower possible but nothing significant. There is the possibility of a storm for the UK Wednesday-Thursday bringing gales to our area as a “bomb depression” emerges in the Atlantic this week and probably tracks across Scotland (which would be less windy as a result, for a change). Details of the storm track remain wobbly at the moment but the strongest winds will be found on the southern flank of the LOW centre and various models suggest that the SE could have some strong to gale force winds, albeit nothing like the scale of Scotland recently. Models suggest a steep pressure gradient as the low tracks somewhere across the north of the UK. The precise track will determine the impact on the SE. Current models suggest the strongest winds for the SE will be associated the warm front approaching Wednesday night / Thursday morning. Gusts could exceed 50mph inland and more on the coast with some excitable models suggesting more but these usually calm down nearer the time! 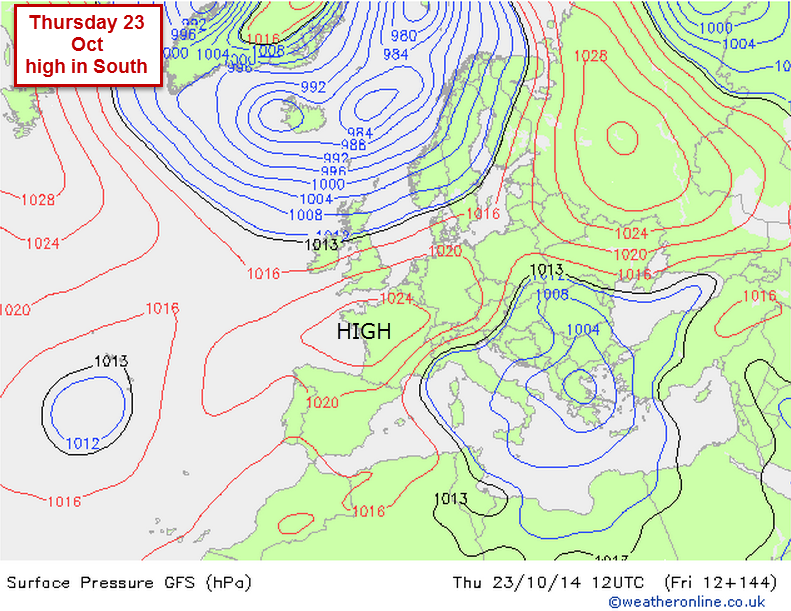 Nevertheless, wind and rain are likely to be significant and expect updates on weather warnings this week. Colder air follows the storm so showers following cold fronts could turn wintry so watch for updates. Our own amateur “Wight-Wash Oscillation (WWO)” is an attempt to quantify the potential impact / severity of storms on the South East of England. The WWO is simply a crude measure of pressure difference between the Wash and the Isle of Wight ( a mini NAO!). As a benchmark the St Jude storm (99mph Needles max gust) had a WWO of approx 10mb (976 Wash-986mb Wight) and the modest storm of 12/12/14 was a 9mb on the WWO. Current models shown below have a variety of WWO results from 8mb UMET up to 12mb for GFSP. A difference of 1 or 2mb can make a big difference to the severity of the storm as pressure gradient ultimately drives wind speed. Nevertheless, the WWO is just for fun but interesting to see how it works out in the event. On the basis of our WWO this storm currently looks less severe than St Jude, which is a good thing because that storm caused a reasonable amount of damage. 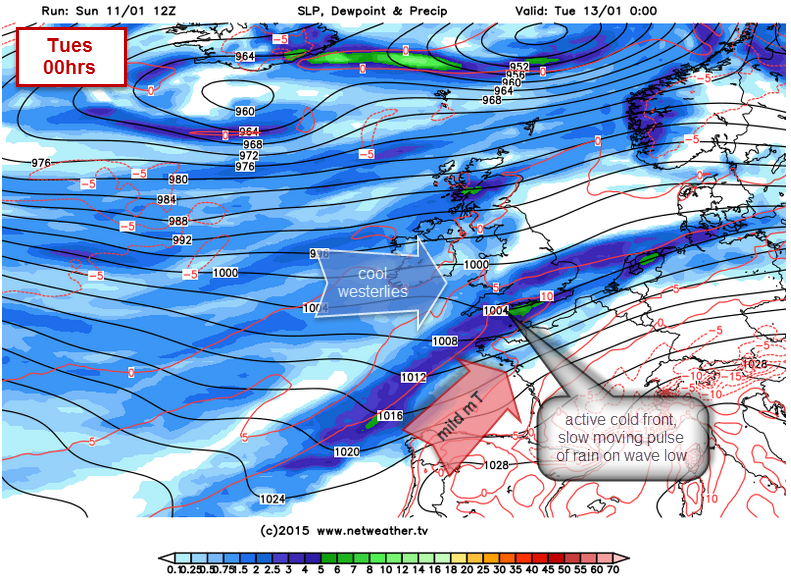 The unsettled weather this week is being driven by an active jetstream over the Atlantic. This itself is partly a product of the tremendous temperature gradient over the northern hemisphere and particularly over the North Atlantic with freezing air pouring out of a frigid Canada meeting warm sub-tropical air emerging round the Azores High from the south. These air masses are set to clash on Monday at the polar front over the Atlantic. Whatever the storm brings it is looking likely that afterwards a cool northerly wind from the Arctic will bring temperatures further down by the weekend. Although a long way off, for Reigate and the SE it is unlikely to be snowy and most likely to be the frosty and cool type of cold! Further ahead some models build a pattern into later January (around 20) that could be conducive to cooler conditions: with possible easterly or NE winds for a time as a low sinks into Europe, though this is not looking either particularly extreme or long-lived. Meanwhile, the North Atlantic Oscillation is set to remain positive, though decline somewhat to neutral, which means that the LOW over Iceland and HIGH over the Azores synoptic pattern is likely to be maintained, albeit possibly less pronounced and with more anomalous meridional moments of cold incursions possible. This would mean a continuation of the broadly zonal westerly flow of mild windy and fairly wet unsettled weather for the foreseeable future. Conflicting signals like this have riddled longer range forecasters this winter: the stratospheric warming was only moderate, much to snow-lovers disappointment, and some supposed good indcators of colder winters (the OPI / early Siberian snow cover in October) have apparently failed to live up to forecasting skill expectations as yet. A month or so of winter to go and no significant signs of persistent cold … yet! Reigate weather for next week to 10 days is overall set to calm down somewhat and, for us in the south, be generally drier and warmer than average for the time of year, most of the time. Temperatures are unseasonably warm over the next few days with night times barely falling below teens and daytime reaching 21C. This is due to the southerly winds bringing warm air from Spain. A slack static cold front divides the really warm air over the SE from the cooler air to the NW. This cold front will bring cloud and rain at times across the SE, especially to the south coast, as it drifts SE over the weekend. Winds on the coast will also be more noticeable over the weekend with 20mph+ possible, but staying mild over the weekend. The temps are likely to slip very slightly as the weak cold front edges SE on Sunday bringing some rain through the SE and more wind to the south coast. Unfortunately, there is a hiccup to this generally benign warm weather. A gradual rise in pressure is set to be sharply upset temporarily by the remains of Hurricane Gonzalo, now battering Bermuda as a Cat 3 storm and due to arrive UK early next week late Mon /Tues. Gonzalo is modelled to arrive early/mid next week. 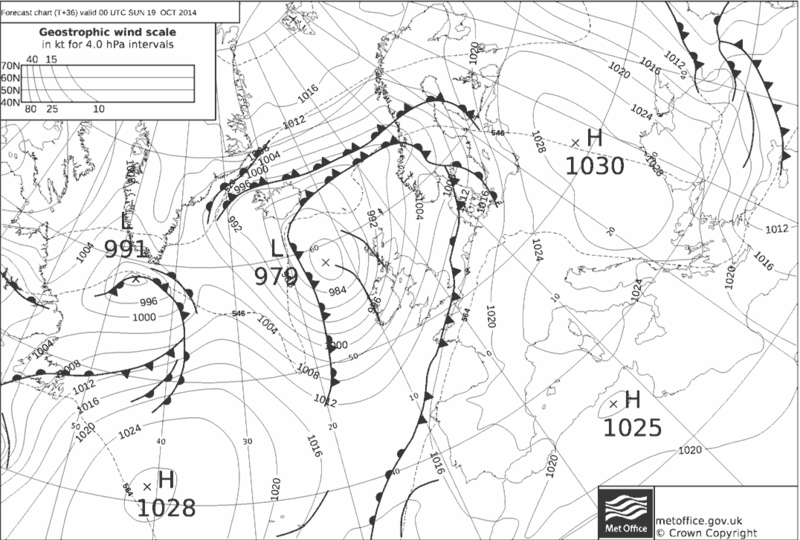 Forecasts suggest Gonzalo will merge with the persistent Atlantic low near iceland and ride the jetstream across the Atlantic arriving late Monday as a 980mb low (not especially low) , bringing gales initially to the west and NW coasts and then gales to through the North Sea later the same day. Some heavy rain is likely but the SE and Reigate looks currently likely to miss the worst. After its passage across the north of the UK, the centre of Gonzalo appears to move SE down into the North Sea and behind a potentially vigorous cold front usher in significantly cooler NW winds of some potency, albeit briefly. These appear to peg down temps a while, especially on NE coasts. Thereafter, indications are for a gradual improvement in the south as high pressure builds over the continent, albeit with some fronts reaching across to the south at times before a HIGH pressure seems to be suggested for the last week in October. If this comes off a dry and settled spell can be expected for half term. The location of the HIGH starts in the south where mild conditions can be expected but the anticyclone could slip north and topple east. if this happens then temps will fall as a cool easterly flow are brought in from a cooler continent creating a more foggy autumnal feel. The charts below show the possible scenario for the last week in October and very start of November with things cooling off. So in summary the weather for half term is generally settled, warmer and drier than average for the time of year but with a significant hiccup as Gonzalo arrive early next week bringing a plunge of cool polar maritime air down across the UK and the north sea behind this sharp active system. Thereafter, a gradual improvement to the last week of October when an anticyclone is set to build across the UK bringing autumnal foggy end to October as temperatures drop to November. Note that extra-tropical storms upset models so keep an eye on any changes to this forecast.